For several years now I’ve been planning on doing some American Civil War models for use with Fire and Fury. When Pendraken came out with their new range of 10mm ACW in the summer of 2012 I bought a few packets with the intention of painting them up and seeing how they looked painted. Until a week ago they’ve been sitting in a box in my study, though I did manage to convince some friends to join in with the project ans several of them have substantial forces already painted. What’s finally got me going with the things are the Longstreet rules from Sam Mustapha, we’re about to play a campaign at the South East Scotland Wargames Club and I’ve started to get the toys ready. I might have painted the things up for Longstreet, but they’ll work just as well with Fire and Fury. The flags come from the Warflags web site – they’re free and can’t be beat for value. I resize them using Corel Draw then print them out. I don’t know how I wound up painting Union troops. 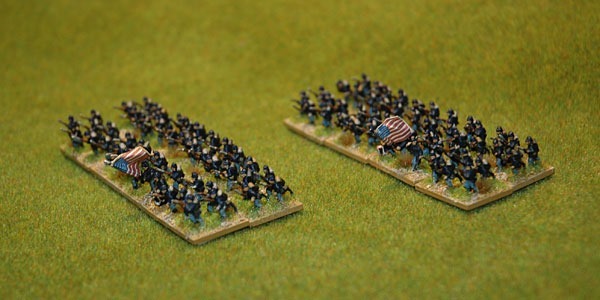 I normally play Confederates in ACW games and i really hate painting Union figures, the most boring figures I have ever done. Still they’re quick enough – block paint, wash with ink then base and they loo fine from a distance. But I won’t be getting people to pick these things up and look closely.